SimpatiQCo is a free software suite running on a local server for your research group or service facility. 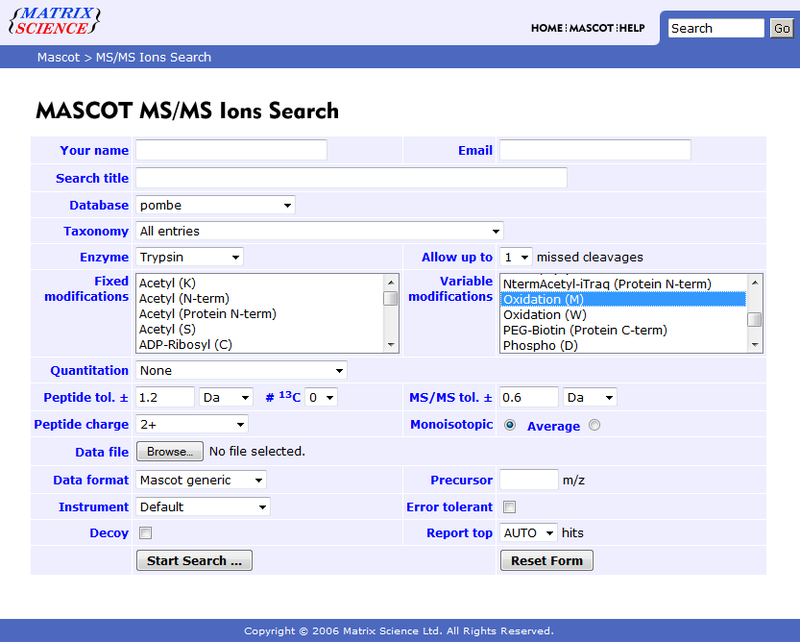 Through a web interface, it allows everyone to upload raw or wiff files (please see list of supported instruments below), stemming from a Thermo mass spectrometer or an ABI Sciex mass spectrometer respectively. The software will then analyse the raw file, extract data (ion injection times, scan times,...) and will also do a Mascot search if a Mascot-server is available. All data (from the raw file and search results) is then stored in a database, which is accessable through the web interface to view several values and graphs for the current run, but also to view long-term data over a time course. It is therefore easy to plot e.g. PSMs vs. retention time, to plot the lock mass deviation over a whole run, or to create a plot viewing the sequence coverage of a certain protein over a long time period. 1.3.2c 2015-02-16 Some bug fixes. 1.3.2b 2015-02-16 Some bug fixes. 1.3.2 2014-09-29 Some bug fixes. Move mouse over slots (top-right) to see which runs are currently processed. Run-type creation and management made more easily. Simpler database structure for better performance (not like previous versions one table per run, but a few central tables). Added read out of CTCD and RawOvFtT factor for Qexactive instruments. RawOvFtT describes charge count in FT cell but must be multiplied by CTCD compensation factor for MS1 scan (done by SIMPATIQCO). For MS2 (iso < 100) RawOvFtT alone is sufficient. A small bar on the upper right gives information about the current workload. Parallel file analysing is now limited to three, all others are queued. Intruduced datepicker for peptide list graphs. Minor bug fixes (hot folder). Hot-folder, start files automatically when they are copied to the hot folder. More comfort using the FTP or direct copy upload. Posibility to manualy edit peak data (area, height and fwhm). A new log system. Log entries can now be pre-defined and shown/hidden in the time-course graphs with one click. FTP or direct copy upload for proecessing huge files (>2GB and multiple files at once). Please note: If you use or install simpatiQCo, you agree to the licenses in the "Licenses" directory (included in the download). The installation progress takes some time, but should be no problem for a person with some IT-Knowledge. In short, you will install a PostgreSQL database and a package of an Apache webserver including PHP. You will then copy the SIMPATIQCO site (many PHP scripts and other stuff) to this server and do some minor configuration. We strongly recommend installing SIMPATIQCO on a dedicated PC, rather than on a computer that is also used for other tasks. First, output of server messages make it difficult to perform other tasks. 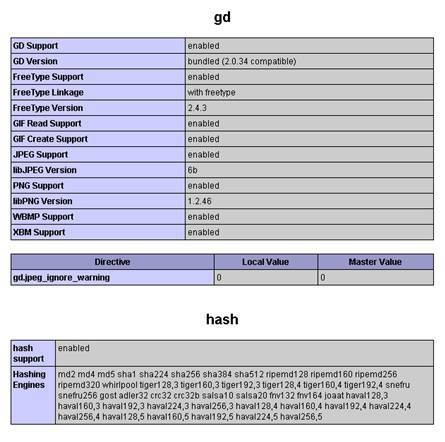 Second, other programs installed on the PC, such as programs "listening" on port 80 which is required by the Apache server, are the main reason for installation problems. If you have any questions, please look at the FAQs or contact us directly. The data filesystem must be NTFS (not FAT32 or others) for setting accessions for apache etc. The Regional- and Language Settings for decimal symbol must be set to "." not e.g. "," and the List separator must be set to ",". Otherwise Thermo MS-Filereader (for reading raw files) will fail. Do not install SIMPATIQCO and its components over a net drive. Copy the whole directory to your local hard drive on the server and begin the installation process. Currently, it is not possible to use another port than the standard HTTP port 80 on the Apache webserver. SIMPATIQCO was developed and thoroughly evaluated on WindowsXP 32 bit/SP 2 and Windows7 64 bit. 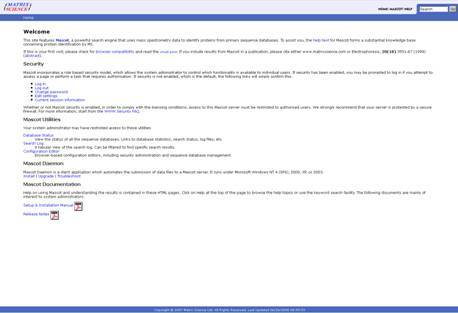 Create the www-directory "www" on your hard drive. E.g. : D:\www. The web documents of Simpatiqco will be stored here. Create a temp-directory "temp" e.g. : D:\temp. Make sure, that there is enough storage place in this directory to temporally hold your files (several GBs). Create a directory which will hold ftp-uploaded or directly copied raw files e.g. : D:\temp\ftp. Create another directory for the "hot" folder e.g. D:\temp\hot. Data uploaded to this directory will be processed automatically when the "hot" folder service is active. Make sure that there is enough storage place in these directories to temporally hold your files (several GBs). Install the Thermo MSFileReader from "Install\MSFileReader64Bit" by executing the .exe file. Choose the 32bit version only. If asked, also install additionally needed software. If your computer does not have the .NET framework installed, or you are unsure about it, install .NET framework 2.0 from Install/dotnetfx.exe. Mascot searches can only be done if the framework is installed, because msconvert from ProteoWizard needs it to run. If the installation programm tells you that this version is not compatible with the currently installed one, cancel the .NET installation and simply continue as you already have a .NET framework installation running. In addition .NET framework 3.5 SP1 needs to be installed as it is required by EasyPHP which is used by SimpatiQCo, and .NET framework 4.0 needs to be installed as it is required by PeakAnalyzer, a component of SimpatiQCo. Therefore install .NET framework 3.5 and .NET framework 4.0 from the Install/ directory or download and install the software from the Microsoft webpage. Using Microsoft "Update" is also an option to ensure that all the required .NET framework components are installed on your system. Note: If you already have a PHP/Webserver running and you are familiar with this system, skip the following steps and integrate Simpatiqco there. Please do not install easyPHP on a server where PHP and a webserver is already installed. Install the easyPHP package from the "Install" directory by executing the setup file. Launch easyPHP, and apply the settings like in the image below, Right-click -> Configuration -> EasyPHP, click ok to save. The server will now be started automatically with the operating system. Copy httpd.conf and php.ini from the "Manualy add and edit" directory to your EasyPHP installation path: C:\Program Files\EasyPHP-5.4.0RC4\conf_files. Doing so will overwrite the original files, you can backup them before the operation. Note: If you use another temp directory than "D:\temp" then after copying you have to open the above mentioned file php.ini and change the following line: upload_tmp_dir="YOUR TEMP DIRECTORY". (line 190) DocumentRoot "D:/www" -Leave this as it is, if you use D:/www as your servers directory for your websites including SIMPATIQCO. (line 250) <Directory "D:/www"> -Leave this as it is, if you use D:/www as your servers directory for your websites including SIMPATIQCO. Don't forget to save the files with your settings. On the EasyPHP frontend, right-click -> Configuration -> PHP Extension: Check the following extensions, uncheck all others. Click the "Apache" Button on the easyPHP frontend and select "Stop" and then "Restart". Don't use "Restart" only, it might not work. Copy (and therefore keep the subdirectory structure) the files and folders from "Copy to www" to your "www" directory. Reboot the computer. Really do, please. Test the connection to your server and the php configuration. Open a browser and navigate to: "localhost/phpinfo.php". A listing of your php configuration should appear, as shown below. If the Apache webserver fails to work properly, please check your PC for any software that might "block" port 80, as this is the most common reason. Such software needs to be uninstalled. If you see these settings, your PHP and Apache configuration is working! Create a new empty directory for the Database(PostgreSQL)-data with a few GB storage place. Install PostgreSQL 9.0 from the "Install" directory. During install, use the default settings when asked, set the PostgreSQL data directory to the above mentioned Database(PostgreSQL)-data directory and remember the port number for PostgreSQL, usually 5432. Also carefully remember the root password you choose during installation. Do not launch Stack Builder at the end of the installation. 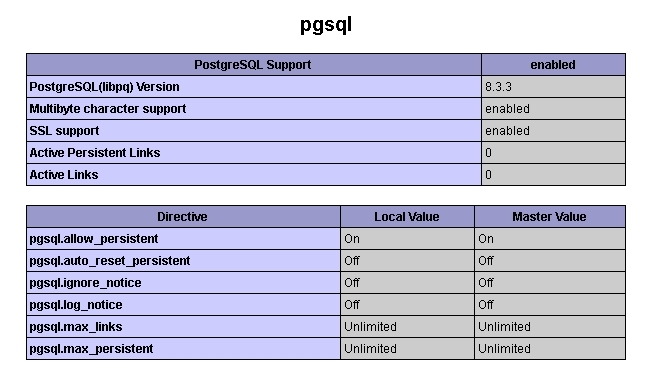 If it was not already installed during the Postgres installation, install pgAdminIII by executing "Install\pgadmin3.msi". Use the default values. Start pgAdminIII. If there is not already a default connection, create a connection by clicking Menuebar->File->"add server". Use the following values: Name: "simpatiqco", Host: "localhost", Port: "5432", Maintenance DB: "postgres", Username "postgres". Also provide the root password you used for installation and enable "Store password". Click Ok to save. Open the connection to the server (Doubleclick) and create a new Login Role (Right click, New Object, New Login Role). 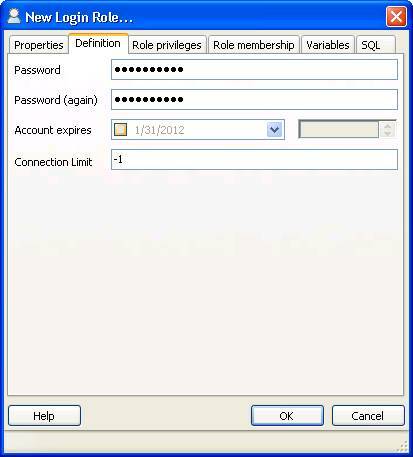 Set the Name and password of the login rule to "simpatiqco" and change the other values according to the images below. Click Ok to save the login rule. 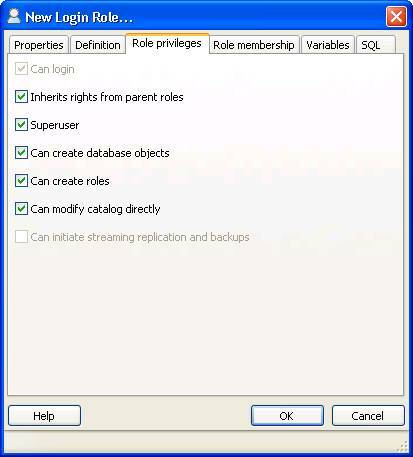 Right click on "Databases" and create a new database. For the new database, use the settings according to the images below. 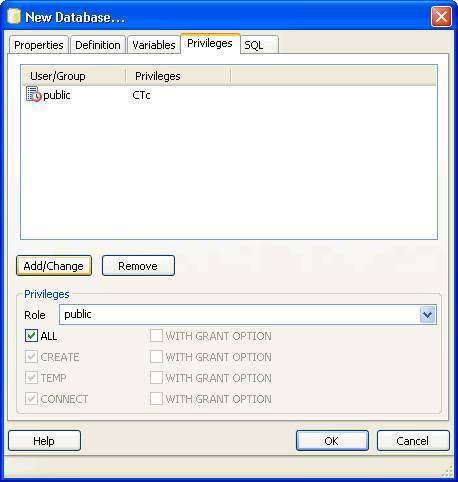 Under the "Privileges" tab, add privileges for role "public" (check "ALL", click "Add/Change"). See image below. Click "OK" to create the database. 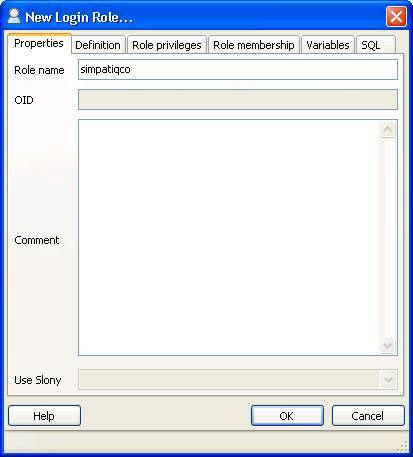 Then goto "right click"->"Properties" on database "simpatiqco" and add privilege "simpatiqco" as shown below (check "ALL", click "Add/Change") and click "OK" again. 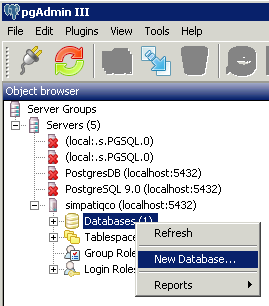 In pgAdminIII, select the newly created SIMPATIQCO database and click the SQL button from the menu bar. 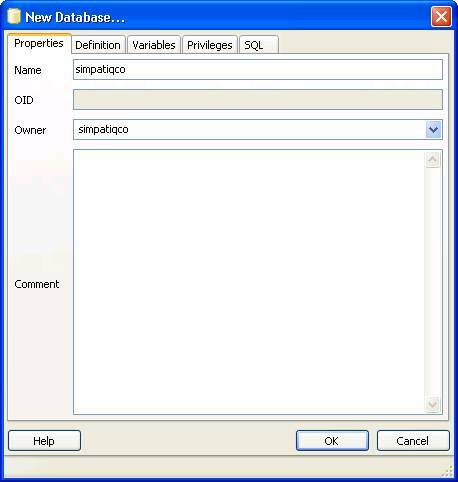 Open the simpatiqco.sql file from the "Manualy add and edit" directory. Press F5. 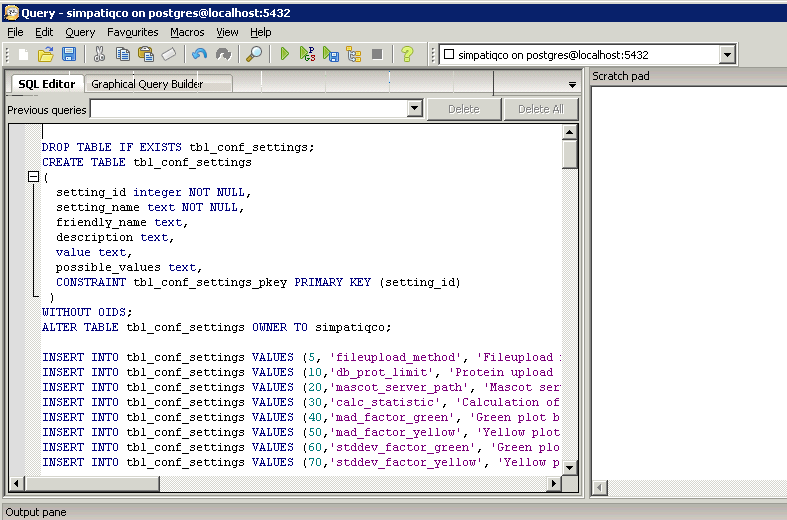 The query will be executed and the database-structure will be created. Ignore NOTICE informations. The last line should look like: "Query returned successfully..."
Open www\SIMPATIQCO\inc\conf.php in a text- or PHP-editor and edit the following lines corresponding to your servers IP address or name in the domain and the directories of your system. Default setting for directories are "D:/temp" and "D:/www". These directory settings should only be changed if you use other locations. In this case, don't forget to also update the "log_dir", "graph_cache_dir", "raw_dir" and "hot_dir" entries. Now connect to the Webinterface on the server. Open a browser and navigate to: "localhost/SIMPATIQCO"
Also try to connect to the system from other computers by navigating to: "http://yourServerNameOrIPadress/SIMPATIQCO"
CONGRATULATIONS, you can now start to upload raw files. Click on the default instrument and for the first upload, choose the pre-installed run-type "Raw analysis only" to see if the file upload and raw analysis works. You may have to install Adobe flash (for the upload) but your browser will prompt you anyway if this is the case. After finishing the installation process completly, visit the Manual to learn how to configure the system to your needs (adding/renaming instruments, etc.). If you have a running Mascot server in your unit, navigate to the "Settings" page and fill in the Mascot-server address. The Mascot- server address is a URL (including the "http://" entry and all slashes) when typed into a browser gives the welcome screen like in the image below. If the server can be found, you will be able to create run-types including a Mascot search. If no Mascot server is found, every uploaded run will end up as a raw file analysis with no MSn search. Note that it is not possible to start searches on the matrixscience server, because of the server side size limitation. It is likely to expect problems when using firebug or similar tools in your browser. For troubleshooting check the manual or the FAQs on this webpage. SIMPATIQCO comes along with many different techniques and software packages. It is possible to install the system locally for your lab, but not to distribute the software. Currently it is forbidden to set up the system as a public service, commercial or non-commercial. Please check the licenses in the "Licenses" directory for more details. SIMPATIQCO installed, running and reachable via the web interface. Navigate to the Raw files panel, select your instrument and click the "Upload new raw file" button. Since SIMPATIQCO needs to know how to handle the file and the resulting data, you have to choose a run-type by clicking on it. The site will reload and depending on your settings, the flash-upload area or a simple "browse" button will appear. You can choose the upload method (flash or ajax) in the "Settings" page. The picture below shows the flash-upload button. Click the flash utility and select your file to upload. Attention: Keep this windows/tab open in your browser while uploading. Otherwise the upload and further file analysis will fail. If the upload succeeds, the raw analysis and search (if available in the run-type) will start soon. The status will update automatically whereas the left icon represents the raw analysis and the right icon represents the search status. If you click "FTP/Direct copy upload" you will see a listing of all files found in the e.g. D:\temp\ftp directory. You can then check which files should be analyzed and which run-type should be used. This directory is set in the /simpatiqco/inc/conf.php file. You can set up a ftp server of your choice or use smallftp.exe which can be found in /simpatiqco/ftpupload. Set the default upload directory to your simpatiqco ftp directory and use a client to upload files to simpatiqco. If you have access to this directory for instance via a network share, it is also possible to just copy files to this directory. Please note that raw data files will be deleted from the ftp folder after processing. The "FTP/Direct copy" functionality exists for two reasons: With this feature it is possible to upload/Launch multiple files at once and it enables you to upload huge files (>2GB) which could be a problem doing so over the web interface. Please keep in mind that some FTP-clients (e.g. firebug) have a built-in 2GB filesize limit. To ensure stability, it is recommended to process raw data in repeated batches of up to 30 files. You can specify a "hot" folder in conf.php (described in the installation manual). On the settings page you will then be able to start the hot-folder "service". SIMPATIQCO will then in the hot directory create a directory structure for every instrument and will also monitor these diretories for any new files. Any raw file copied to one of these directories will be processed automaticaly. You just have to specify the run-type in the name of the raw file by using the term "rtidX". X is a number and the ID of the run-type (you can see the IDs of your run-types when opening the settings page, at the run-type/instrument assigning section). For example, a raw file named "1012_BSA_CytoC_rtid12_100min.raw" will be processed using the run-type having the ID 12. Raw files with no rtid tag will be ignored. Please note that raw data files will be deleted from the hot folder after processing. This option alows a total automatic workflow since one can also automatically copy raw files to SIMPATIQCO when acquisition is finished. See the FAQs how to do so. Since there is no interface for this operation, one has to add instruments manually. This is simple done by adding a line in the SIMPATIQCO database. Open the tbl_instruments table and fill in the data for the new instrument. The name_long string will later appear in the SIMPATIQCO web interface. Note that the id is a primary key, so just count this number up and do not delete lines. If you want to remove an instrument, just set the "active" column to false. If there is a column named "dev", set its value to false. The column "order" just regulates the listing of the instruments from left to right on the simpatiqco main site. All other columns are optional. The columns "calc_statistic_period" and "run_type_ids" will later be filled when you go trough the settings and run-type settings. Each uploaded raw file will be analysed and the resulting data (raw file facts and search results) will be stored. 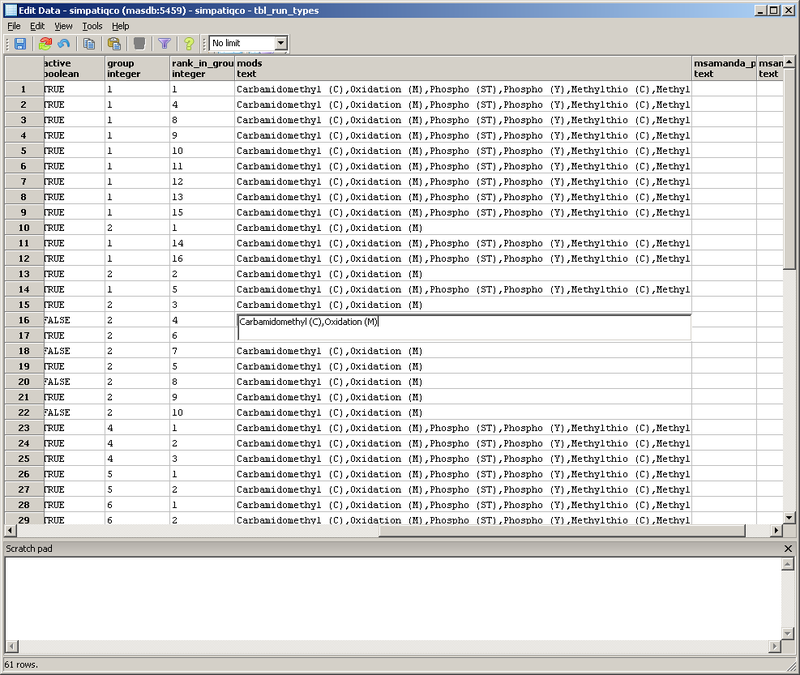 To make these values comparable over time, the raw files need to be analysed in a certain way, which is not changing. The "run-types" hold these information, espacially the Mascot-search paramters. So each raw file is assigned to a certain run-type. Run-types can easily be created in the "Settings" page (see manual "Adding and removing of run-types" below). For better usability, the run-types can also be assigned to specific instruments. This has no impact on the statistic or what so ever, but is only a visual helper. For example, it is not necessary to make an ETD-run-type selectable for a non ETD instrument. This assigning is also done on the "Settings" page. The picture shows the self explaining matrix. If your mascot-server connection works, you can add run-types with different search parameters. Navigate to the Settings pane, and scroll down to the Status area. If you see something like "Mascotserver: Connection OK" then your mascot-server is reachable. Scroll down to the "Run-type configuration" area, enter a Name for your new run-type, choose the settings available on your mascot-server, and click save. The "Display in menu: group number" item, lets you choose in which group your run-type will appear, when a user clicks upload new raw file. This is just an optical feature for providing a better overview regarding the different run-types. There are 10 groups possible and each group can hold infinite numbers of run-types. If you want to move a run-type to another group or up/down within a group, just select it by clicking it, then two small arrows on the left will appear. An "OK" sign will appear on the left if your run-type was saved successfully. If not, check the input fields for possible implausible values e.g. letters in numerical input fields, or using a "," instead of a "." -depending on your mascot server settings. It is not intended to ever remove a run-type, since every uploaded run is bound to the latter. Therefore, if you want to remove a run-type (make it disappear from the menu), just enter the SIMPATIQCO database, open tbl_run_types and set the active column to false. On the Settings page you can create peptide lists to observe e.g. Retention times of certain peptides. Create a list (a peptide list is always bound to a certain run-type) e.g. "BSA peptides", then fill the list, by navigating to the search results. Click on the proteins which contain your desired peptides and click the "+" item. You will then be able to choose the peptide list which your peptide should be added to. To use your peptide lists, navigate to the Time-course Panel and select your run-type. If there are any peptide lists attached to it, they will appear, together with the available plots. If you click a peptide list, the corresponding plot for each peptide will appear for the last runs. To observe certain values about a protein of interest over a long term e.g. the sequence coverage of Bovine Serum Albumin (BSA) in an everyday test run, you must tell the system, that you want to make e.g. BSA a protein of interest (POI). Do this by opening a search-result and click on the protein. A little white diamond appears next to the protein name. When you click it, this protein will become a protein of interest for the run-type of this search result. It will be marked in green color from now on, and it will appear in the list of proteins you can select for monitoring long time values in the Database pane. If you want to remove the POI status from a protein, navigate to the Settings pane, scroll down to the Proteins Of Interest Pane, and find the corresponding cell (Protein name/Run-type) and click the X icon. If this is the case, the upload of raw files is working. For further debugging open the corresponding log file (from today) in the temp directory. Also, log on to your server and upload a raw file. You will be able to watch the php scripts starting and working and read their output. This gives you a very detailed view at which point the system fails to analyse the raw file.If an uploaded run ends up with an error and the parameter "keep error file" (settings) is set to "yes" , the temp directory of this run will not be deleted. Look into the raw-file-temp-directory, where you will find a directory for every uploaded file (corresponding to the run id). Check if the created mgf and csv files have valid file sizes and try to open the raw file manually. NOTE: Adapt the above code to your settings. If you made a standard installation, then EasyPHP is in the Program Files (x86) directory and SimpatiQCo is on D:\www. The last paramter is the ID of your run. If the command succeeds, you can watch what happens and when exactly the analysis crashes. 1. 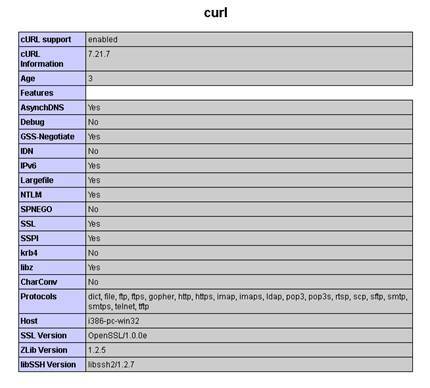 I already have Apache/PHP/IIS running, how can i use my setup? Apache: Config your apache httpd.conf like the one which comes with simpatiqco. IIS: Please do follow the installation guide and install simpatiqco with apache. To run apache parallel to IIS open the apache httpd.conf and set the listening port to e.g. 8080. You can then contact simpatiqco by going to e.g. : localhost:8080/simpatiqco. 2. How to add modifications for the Mascot search? You can add any modification from your Mascot server as a variable modification in simpatiqco. 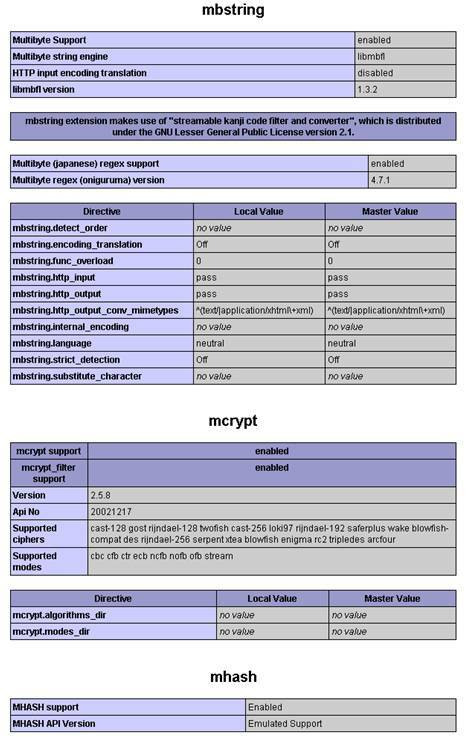 Check which modifications your Mascot server provides (the exact string is necessary). You can do this in the Mascot search web interface (see screenshot below) or in every other program (e.g. Proteome Discoverer) which connects to your Mascot server. Now open pgAdminIII. Open the simpatiqco database and navigate to Schemas->public->Tables->tbl_run_types. Select the table and click on "View the data in the selected object." in the top menue of pgAdminIII. 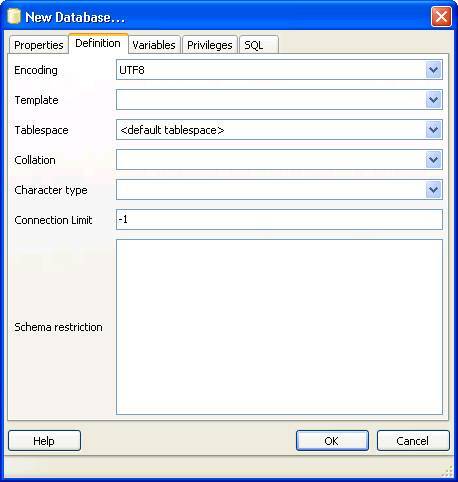 A table with the runtypes will appear. In the row of your runtype, go to the column 'mods' and double click in the field. Now enter the modifications, use the exact modification string like on your Mascot server. If you add more than one, separate them with a comma. Use no spaces between the modifications and don't append a comma at the end. Press F5 to update the table and exit pgAdminIII. That's it, every sample started with this runtype will be searched with the modifications you entered. 3. How to automatically copy and process files after acquisition? When starting a batch on your instrument, run a bat file when the acquisition is finished. Enter the path and name in the "post acquisition" field. For example: "D:\simpatiqco.bat %R". The %R will hold the raw file name. 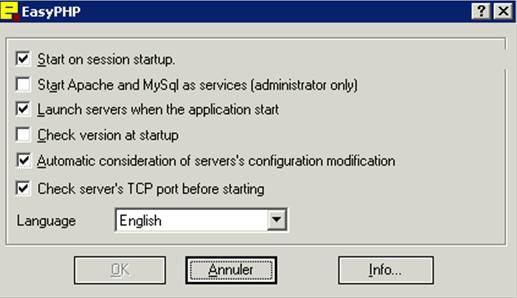 IF NOT %m%==%m1% copy "%1" "\\YOURSERVER\hot\YOURINSTRUMENT\rtid2_%m%"
Use mpause.exe (can be found in SIMPATIQCO/hotupload) to create a short pause after acquisition (so that writing of the file is truly complete before copying starts). The example provided checks if the filename contains the substring "BSA". If this is the case, the raw file is copied to the hot folder, and an rtid-tag is added as a prefix to the file name (here run-type id 2). This tag is required for SimpatiQCo to select the appropriate method for automatic processing. Alternatively you may specify the rtid-tag already in the file name. You may have to make the "hot" directory shared to use the network path starting with "\\" to copy the raw files to the hot folder. Of course, set the copy paramters to your system (your server and your instrument name). For troubleshooting, check if you can open the directory "\\YOUR-SERVER\hot\YOUR-INSTRUMENT" from another computer and if you are able to copy files to it. Remember that the YOUR-INSTRUMENT folder structure within the hot folder is created automatically when first starting the service in SIMPATIQCO (and any files present in an existing "hot" folder structure at this timepoint would be removed). Therefore do not change the folder structure manually. Copy the bat file and mpause.exe to e.g. : "D:" and give it a try. For troubleshooting, you can watch SIMPATIQCO monitor and work in the hot folder when logging on to your SIMPATIQCO server.